Lost recordings made just after World War II of Holocaust survivors singing songs have been rediscovered at the University of Akron. These recordings were part of a project by Dr. David Boder, a Latvian Jewish psychologist who had settled in the United States in the 1920s and quickly made a name for himself in academia and as a clinician. He became an American citizen in 1932, but he traveled regularly to Europe and kept in touch with his family until the war disrupted movement and communications. In May of 1945, just days after the Allies accepted Germany’s unconditional surrender, Boder got the idea to interview displaced persons, Holocaust survivors, victims of the dislocations and horrors of World War II. His aim was first to get a record of victims’ experiences while it was all still painfully fresh. It was important to him to ensure Americans understood fully what had happened to people, how they managed to survive in ghettos, concentration camps, labor camps and on the run hiding in forests or barns or wherever shelter was to be found. He hoped that disseminating their stories would generate public support for immigration of war refugees to the US. Also, as a psychologist, he had a broader interest in how people cope with great trauma, a subject he would continue to investigate throughout his professional life. His plans took a while to come to fruition. Financing the trip, securing the necessary permits to travel through occupied Western Europe delayed his plans for more than a year. Finally in July 1946, he arrived in Paris and dove right in to the project. 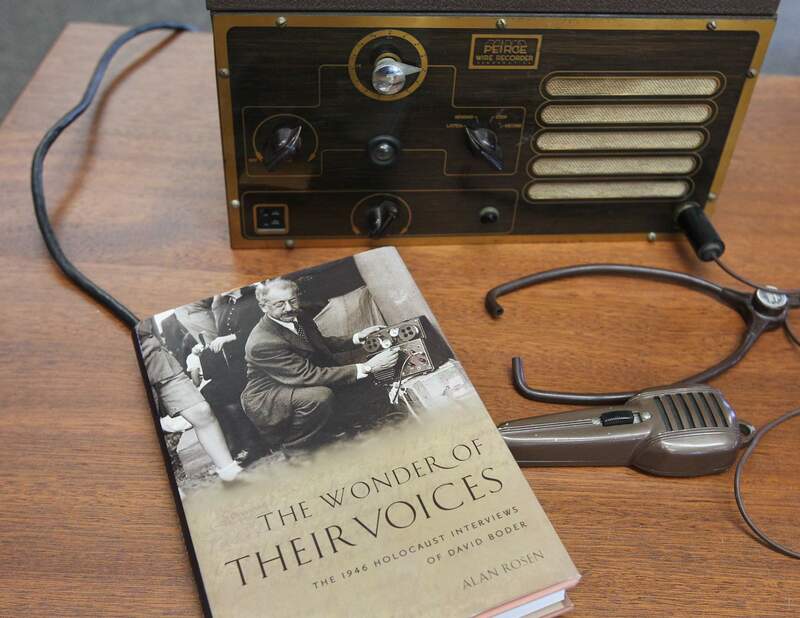 Using what was then bleeding-edge technology, a wire recorder, Border spent the summer at 16 different locations in France, Switzerland, Italy, and Germany, interviewing 130 displaced persons — mainly Jews, but also 21 non-Jews — in nine languages. The recordings, which included religious services and songs as well as interviews, took up 200 spools of steel wire. Border’s interviews are the earliest extant recordings of Holocaust oral histories today. David Boder died in 1961. His archives, including the 1946 wire reels, were dispersed among several different institutions. 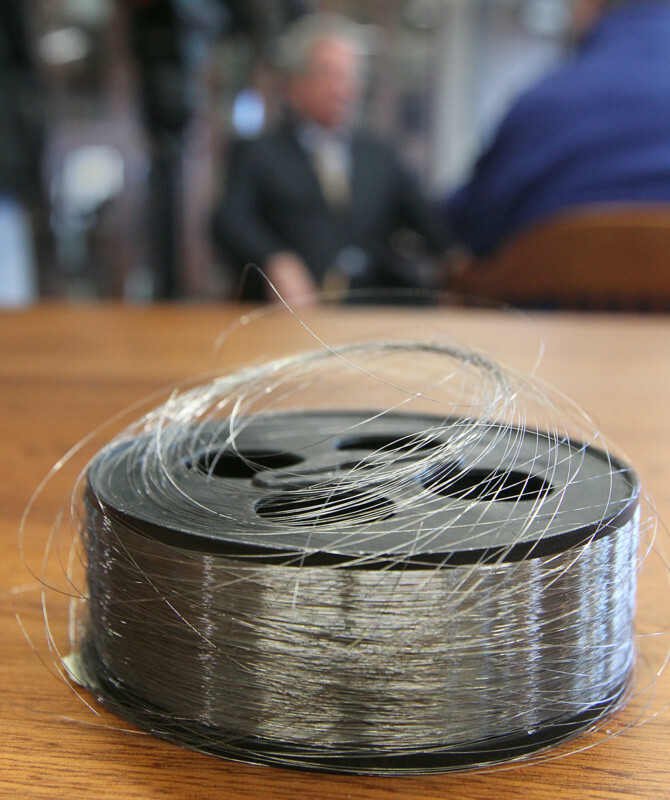 In 1967, 48 spools of Boder’s wire recordings entered the collection of the University of Akron’s Drs. Nicholas and Dorothy Cummings Center for the History of Psychology. They were fully inventoried at the time. Most of the other recordings mentioned in Boder’s writings were at UCLA or were rediscovered in the Library of Congress and the Illinois Institute of Technology in the late 1990s. There was one spool Boder listed that was missing, however. It was songs song in Yiddish and German by Holocaust survivors recorded at a refugee camp in Henonville, France. 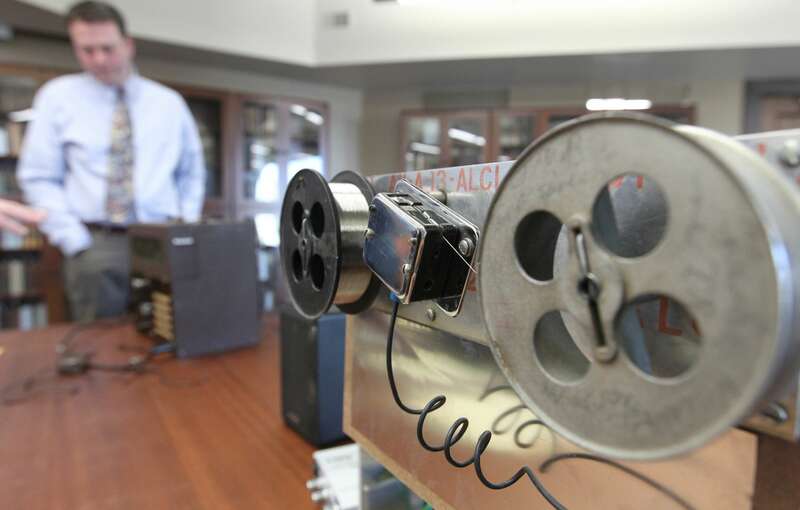 Despite years of attempts, researchers at the University of Akron had not been able to play the wire reels. They had some old wire recorders, but they either weren’t compatible or couldn’t be repaired without a major overhaul of the original parts, which is far from ideal, obviously, from a historical preservation perspective. Finally they were able to find one on eBay which they repaired with new and cannibalized parts from other machines. With their new/old Frankenrecorder, the research team was able to convert the spools to digital format. The digitization project was underway when they found one spool in a tin box that had been inventoried as “Heroville Songs.” It was a mistake. The label on the box actually said “Henonville Songs.” It was the long-lost spool. UA multimedia specialist Jon Endres digitized the song recordings and was the first to hear those haunting voices in decades. You can read his blog entry about the discovery here. The team shared the digitized content with the U.S. Holocaust Memorial Museum in Washington, D.C., where experts translated the songs, five in Yiddish, one in German, and explained the background. Some of Baker’s questions were soon answered. The singer was Guta Frank, and [U.S. Holocaust Memorial Museum musicologist Bret] Werb knew her history. Frank was a Polish Jew who fled from one ghetto to another with her family for four years. Parents and siblings were killed along the way, and she and her sister finally ended up at a forced labor munitions camp outside Czestochowa, Poland. Her sister left behind a memoir, which can be read online. Werb also provided Baker with a translation of the songs Frank sang to Boder. One, called, “Our Town is Burning,” is a well-known song often performed at Holocaust commemorations. Written shortly before the war broke out, the song calls out the complacency of bystanders watching a town burn and doing nothing to help. But Frank’s version was different from the standard rendition of that song. She sang: “The Jewish people are burning.” On the recording, Frank tells Boder that the composer’s daughter sang the song in the basements of the Krakow ghetto to inspire people to rebel against the Germans. A second song sung by Frank was the official song of the labor camp where she was held. Camp commanders encouraged the inmates to sing such songs on their way to work. “They liked it,” says Werb. The lyrics were long known, but the melody had never been heard before. “It’s sung by someone who must have been there,” says Werb. Here are a selection of clips from the Henonville Songs spool. The first is Dr. Boder’s introduction which explains the interviews are taking place at the Henonville camp. The other three are song clips, the last of which is “Our Camp Stands At The Forest’s Edge,” the song inmates were forced to sing for their commanders’ enjoyment.